Wash and chop all vegetables. You can either rough cut the vegetables or cut them in strips or cubs, your preference. Spray a rimmed cookie sheet with cooking spray. Spread vegetables evenly on the pan, and then spray again (toss with a spatula to coat). Bake at 400 degrees for 30-40 minutes. 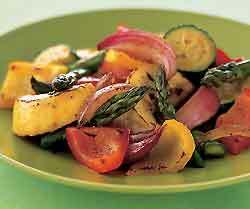 Remove vegetable from oven and place in a bowl. Toss with vinegar and garlic. Serve! In the Martial Arts you need to have a strong foundation so you can maintain a stable stance. You also gain much of your stamina from your legs when sparring since they are usually the first to tire if not conditioned correctly. The following exercises will help increase your stamina and greatly improve your stability by giving you a solid foundation. Position feet slightly wider than shoulder width with toes pointed out. Place weight on heels, pick spot to look at on wall to ensure head stays up, back stays flat, and no bending at the waist. Inhale, unlock the hips, push the glute back keeping weight on the heels, descend until the thighs are parallel to floor, knees should not pass over toes. Exhale, extend knees and hips pushing the hips forward, until upright. Taking a slightly wider than shoulder width grip on bar, position bar at base of neck across the traps, step back from rack. With weight on shoulders perform the squat as described above. Same technique as the back squat except hold the bar in a clean catch or across the front delts, once you reach parallel depth drive elbows up out of the hole. There are a few ways to perform a single leg squat. The one pictured assists in keeping your balance. Alternately you can support yourself using a stick or table and bring your left foot up and place across your opposite knee. Your knee will be bent at 90 degrees. Squat down until your knee is almost parallel to the ground, stand up and repeat 10 times. Return to the starting position and repeat with the other leg. Remember while performing this exercise to keep head and chest up, place your weight on your heel, and push glute back when descend. To add resistance hold weight in hands. Fun and Learning should go hand-in-hand and this video does a great job of explaining the physics of Karate. I speak about the physics and math of the Martial Arts whenever I get the chance so this video is really cool to me. While breaking stuff isn’t my favorite past time this is an excellent explanation of why we can do these things. Get your pencil ready! We are looking for people with Martial arts teaching experience to work in US children’s summer camps. Positions are varied to suit candidates’ level of skill and certification. US summer camps are residential, set in beautiful country settings generally by a lakeside. This is a great opportunity to work in an international setting with staff from all over the world. Application is via the Camp America program. Camp America provides placement matching with a camp, sponsorship for J1 cultural exchange visa, free flight from London and all support prior and during the placement. You must be able to depart for the US in May / June and be available to work for 9 weeks at camp. Further time is allowed for independent travel (often with friends made at camp) according to your own preferences. Participants will be required to purchase medical insurance, and pay for CRB, medical and US visa charges and air & security taxes. Small good faith deposit is payable to Camp America. Total pocket money for the 9 weeks will be $700 to $1200 (depending on age and experience) for Specialists who are certified. Interviews are available throughout the UK and Worldwide. Application Deadline April 2008. Many other positions available for sports and activity experienced applicants, or those wanting to work with special needs or inner city children, or who wish to work in a faith environment. We can also place staff that are not experienced but have the enthusiasm and are prepared to work hard to ensure children enjoy their camp experience. Lots of camps, lots of placement opportunities – Camp America is famous for arranging summer camp placements in the USA since 1969. For more information contact Camp America on: enquiries@campamerica.co.uk alternatively Tel 020 7581 7171 or visit www.campamerica.co.uk. And, Don’t forget to tell your campers about KarateTraining.org! This may strike a cord or a nerve for some readers but this image really struck me. In looking at the stark contrast of the image I began to ponder the different paths our World could potentially take. Will we follow the path of freedom or will we turn down the path of totalitarianism? Observation, intuition and current events unfortunately point to the path of totalitarianism. If that is the case the only amusing observation is that those who lead the march down that path will be the first sacrificed on it’s Alter. A Woman’s Self Defense Instructor and Advocate it amazes me the circular logic that I encounter. We fight for Women’s rights but then we don a head scarf to show support for Muslim women. In Turkey last week 125,000 people turned out to protest a Constitutional Amendment to lift the ban on head scarves on University campuses. The President, an observant Muslim, lauded the amendment and is expected to sign it this week. Prime Minister Recep Tayyip Erdogan called the ban a trial for young Muslim women who are forced to remove their traditional head scarves at campus entrances. Erdogan, whose Justice and Development Party has ties to Islam went on to say, “We will end the suffering of our girls at university gates”. On the other side of this controversy the Republican People’s Party said it would appeal to the Constitutional Court. “This is a Black Revolution. The head scarf is a political symbol,” said lawmaker Canan Aritman. “We will never allow our country to be dragged back into the dark ages.” Nesrin Baytok, another Republican legislator, said approval of the law would turn Turkey into Afghanistan in a domino effect. Now look back up at the image…which world do you want to live in? Oh, that is right I am sure you are thinking that this can’t happen where you live! There is nothing to worry about. Perhaps you should check the recent news from England. 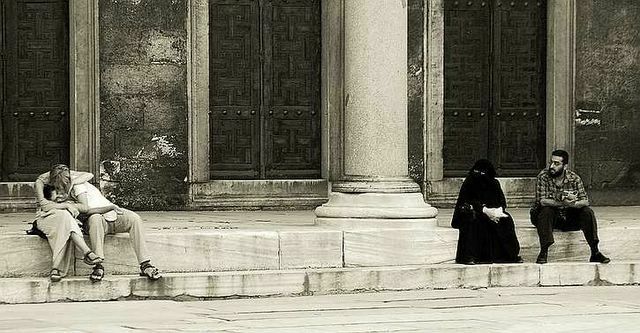 Perhaps I should begin to teach women in my self-defense classes that if they only don a head scarf they won’t need to fear attack…or perhaps I should continue to teach them how to disable their attackers so they can continue to walk down the street with their heads held high. to questions sight may think it knew. I read an very interesting and heartfelt story the other day in the Hartford Courant called “Seeing Life as Good“. It was the story of a Hockey Coach, David Cataruzolo, and his inspiration, his parents. The above poem was written by his Mother, Patti Cataruzolo. His story and her poem has been replaying in my mind since the reading. In the Martial Arts we are supposed to teach us about spirit, independence, faith, respect and courage. I often wonder how many students actually learn these principles? Many people do not think of the Martial Arts (or any sport for that matter) as a path to faith or the spiritual, they are wrong. Through our own physical trials, success and failure, we grow and connect with something greater then ourselves. Many choose to ignore this and indulge in the base pleasures of life. This is a growing problem with our so called athlete role models. It is refreshing to read about a coach, a shaper of young men, who holds to these ideals. As Martial Artists there is much we can learn from the above poem. At a basic level it reminds us to trust things other then our eyes which so often do deceive. All is not as it appears and our eyes can often seal our fate. If we look upon an opponent with trepidation then we are doomed to fail for we quit before we started. Periodically I have my students practice blindfolded. This is an exercise in perception and it is a powerful tool. At first students learn how much they depend on their eyes and how little they trust themselves. As they progress they learn to use their other senses and their self trust improves. Sparring blindfolded is perhaps the biggest hurtle a student faces. Yes sparring. Obviously the sighted opponent has an advantage but the exercise trains the student to use their other senses. It expands their situational awareness making them observant regardless of sight. Like the line in Patti Cataruzolo’s poem, increase your “Knowledge, understanding, strength” by opening yourself to a new world where independence and trust take on new meaning. Maybe in the process you will learn to respect the plight of others different then yourself. Karate was developed in Okinawa, an island in Japan. However, when this martial arts style was developed, Okinawa was ruled by China. Hence the Chinese are credited with the founding of this style. Derived from Kung Fu and Kempo (Chinese Boxing) by the Okinawan farmers in order to fight the Chinese occupiers, and later the Japanese aggressors. It was designed to be swift and violent, quickly fighting an enemy using foot and hand strikes and not getting involved in grappling, though the opponent may be held on to for a short amount of time in order to prevent them from dodging an attack. Non-traditional weapon use was also incorporated into Karate training because of the weapons readily available to farmers. These weapons are still used in practice today including the Kama, Nunchaku, and Sai. Over the centuries Karate has been fragmented into many different styles, forms or schools. Many of these different styles are very similar with only slight differences in their forms, a few however differ significantly in training techniques and forms. An example of the significant differences are the use of circular blocks (which sweep the attacking limb out of the way) or linear blocks (which meet the attacking limb directly with the intent of damaging it). Karate is an continually evolving art with many new styles and schools younger then 100 years. Interestingly, Karate did not take on a spiritual side until the 20th century with the development of Karate-do in which students study Karate as a means of self-improvement. A Martial Ascii Art Figure!